Grimeton Radio Station was listed as a world heritage site because, its original equipment is an exceptionally well-preserved example of the development of communication technology. In fact, it is still in working order. Grimeton (call sign SAQ) still transmits a message to the world twice a year: at the Alexanderson Day (Sunday at the end of June/beginning of July) and at Christmas Eve. The frequency is 17,2 kHz CW. There may also be additional transmissions on special events. Find detailed information about coming transmissions under the News menu. Unofficial transmissions may take place, due to maintenance, training or local events. Reports from unofficial transmissions are normally not confirmed by QSL cards. 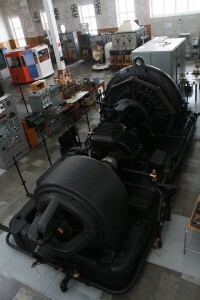 In summertime, the Alexander Society shows the alternator on Thursday evenings, combined with a start of the alternator. On these events, there is no transmission from SAQ. See Events menu for more information.